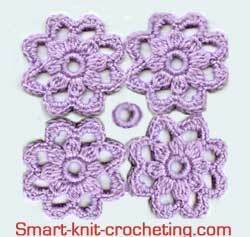 How to Join Crochet Motifs. 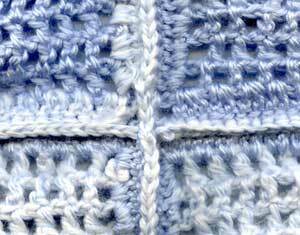 Crochet motifs (or crocheted squares) can be joined to each other in one of the classical ways, shown below. There are no "correct" or "incorrect" ways for joining motifs together. It is only matter of your preferences. Try them all and choose the one you are comfortable with the most. Motifs can be joined by a crochet hook. This method has more technological flexibility and decoration features than joining motifs with a yarn needle. 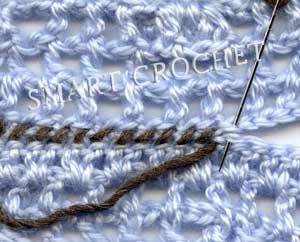 You can use slip stitch, single crochet or chains to join elements to each other. Two motifs can be placed right side-to-right side or back side-to-back side. Decorative effect will be different. Wrong side of the joined crochet motifs. A contrast color thread was used for the better visibility. Right side of the joined crochet motifs. It looks very neat despite a darker color of the thread, which was used for sewing. Motifs can be joined by a crochet hook. This method has more technological flexibility and decoration features than joining motifs with a yarn needle. You can use slip stitch, single crochet or chains, to join elements to each other. Two motifs can be placed right side-to-right side or back side-to-back side. Decorative effect will be different. The elements are placed back side to the back side. 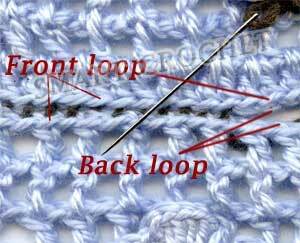 Join through the front loops on the right sides of the motifs. A neat, decorative ridge on the right side is created. Connect motifs while crocheting their last row. Method works the best if motifs have arches on the outside edges. This way connection will look the most decorative and the least noticeable. 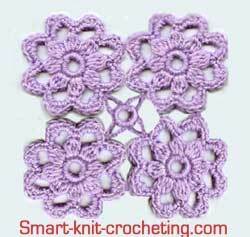 Here is a good example where this method to join crochet motifs (or squares) will work perfect. I used it for crocheting a lacy crochet shawl many years ago. 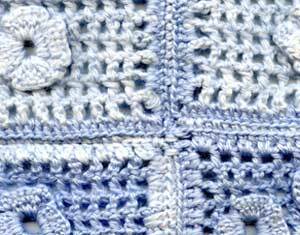 All methods of joining crocheted elements, mentioned above, will work if elements create a regular repeating pattern. When won't they work for joining motifs? Two cases at least can be mentioned here. Motifs are pretty large of have complicated shape. If you join them using any one of the methods above, a final pattern will have the big openings between elements. Motifs have to be included into composition consisting of a few differently shaped elements like in Irish crochet, for example. Let's consider joining of motifs #2 from Irish Crochet page. 8 petals allow to join 4 more motifs around each motif. We will sew 4 motifs together(or better use "join-as-you-go" method). As a result, in center we have a pretty large empty space. To fill it, we usually use an additional small motif-insert. It looks more natural if the inserting element is a fragment of a major motif. Insert: Chain 6, join them in a ring. Crochet 16 single crochets into ring, 1 slip stitch. Pin insert in the middle of the opening. Use chains to join inserts: from insert to the 1st motif, back to insert, to the 2nd motif, back to insert, and so on. There is a very good saying :"Our eyes are afraid, but hands just do it!" You can try one of these methods on your own together with me. I have never tried to do it before. Here is a link to follow: Motif Pattern page.